How Toxic is Toxic Waste? Hello everyone we are already in the middle of the week! (Wednesday) I am pretty surprised the week has gone by this fast! I have always really wondered exactly what constitues toxic waste. Toxic waste comes from a variety of different materials such as plastics, metals, noble gases, etc. But I wanted to have an in depth look at how devastating these byproducts can really be. Especially working for an electronics recycling company it might help me appreciate my job a little more. So I checked out the National Geographic page on Toxic Waste and here is what I found! By definition toxic waste is a “noun poisonous waste materials; can cause injury (especially by chemical means)”. These harmful materials arise from manufacturing processes, agricultural processes, septic system processes, construction processes and other industries. These can come in a variety of forms such as liquids, solids, sludge and contain various toxins like radiation or deadly viruses. Obviously these are all deadly to any living creature, including humans, mercury itself is especially dangerous because it doesn’t really disperse just accumulates. 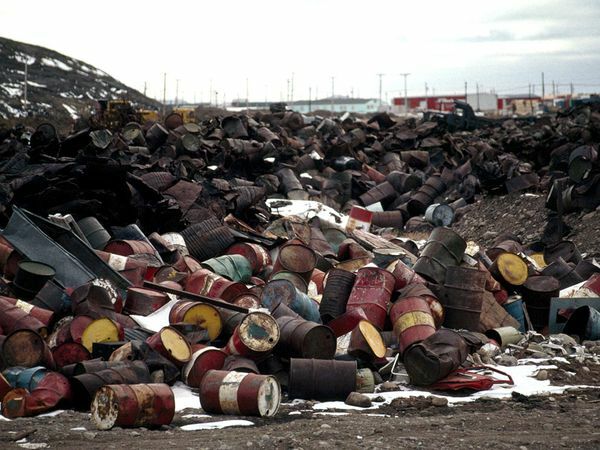 Believe it or not according to National Geographic, the most COMMON way to get rid of toxic waste is to bury it in barrels in the ground…what?!?!. Yes that is a true statement click the link I provided to see for yourself. Especially when dealing with mercury containing computer monitors how could anyone allow the proper dumping of toxic waste to pass as a bunch of barrels buried in the ground?! It does not make sense and will eventually be re-leaked into the environment surrounding it. If waste is LESS toxic another common way to “destroy” toxic waste is to seal it into the ground by placing hard clay above it… again I don’t see how this is particularly preventive. According to the EPA, if you dump waste illegally (meaning it hurts the environment MORE than putting it in a barrel or forgetting to place hard clay above its resting place) then you run the chance of getting charged very large fines. This is a landfill site used by the Air Force supposedly. I thought the barrels were suppose to be underground? Taking a sip of that sewage water would most likely cause life altering problems with your health. I wonder what farm that is? These are Dutch scientists that obviously know the necessary precautions involved when dealing with toxic runoff. Hopefully not many tourists visit this specific location. I myself have had my eyes open with this post and still am a little shocked at what the EPA deems as “acceptable” for toxic waste containment. Have a safe non-toxic rest of the week :). Previous Post6 Ways to Reuse Electronics You Don’t Need.Next PostiPhones Eliminating the Need for iPods?! Toxic waste is not the only problem that affects our health. There are so many additional substances in our food and food makers use unhealthy equivalents. At one time I found a lump of PLASTER in bread! So it looks like plaster is cheaper than flour and that is why they use it… Pity. The more poor country you live the more dishonest people you will encounter. HOLY CRAP thats nasty!!! I am writing a report on toxic waste right now!! !